The challenge will be to tell it apart from free-floating planets that are created during the more mundane process of star and planet formation. I would have thought that telling these apart would be easy, as the speed and trajectory wrt galactic rotation curve should be markedly different. Those things move at 3% of the speed of light. Let's hope we'll never have one coming head-on. We're witnessing planet and star birth in real-time, sadly astrophysicists are plasma ignoramuses and the obvious is never apparent. One mechanism in support of LaViolette's model, where the core is the major source of galactic growth from within. The question not addressed here is where the source material originates from. However, it is logical that with recent news of gas actually being ejected from the core, it is time to put the puzzle together and acknowledge the possibility that merger mania is actually wrong. Within the center of the galaxy does not have a star, they are outside of the central body. If it is "black hole" in the center of center of the galaxy (40,000 to 30,000 ly) then till the stars is 20,000 ly (no stars on the pole center of the galaxy). Question: how authors measured the stars travel through 20,000 ly opaque matter, how they see what is happening there and what is there or speak to children a bedtime story? ".....an unlucky star wanders too close to the black hole at the center of the Milky Way. The black hole's powerful gravity rips the star apart, sending a long streamer of gas whipping outward. That would seem to be the end of the story, but it's not. 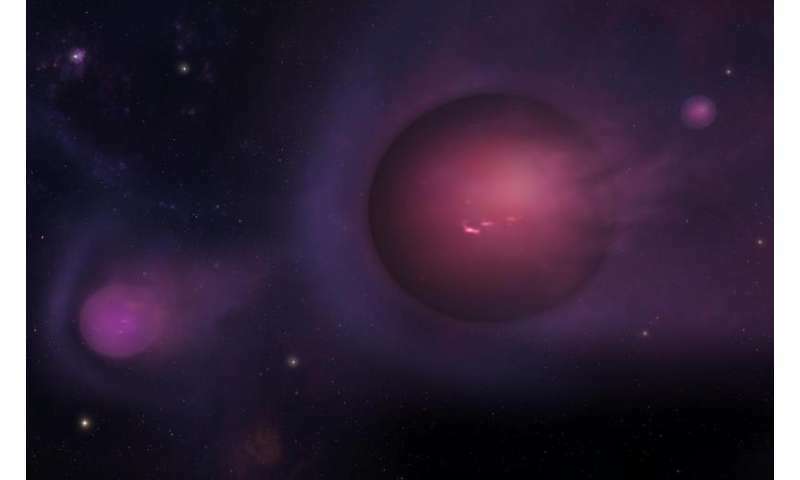 New research shows that not only can the gas gather itself into planet-size objects, but those objects then are flung throughout the galaxy in a game of cosmic "spitball." And we have always been spoonfed the concept that once something is within the grip of the Infinite Gravity Well of a BH at the Event Horizon, voila, that's it, it's all over. Odd isn't it, how planet sized chunks of mass can escape an Infinite Gravity Well at the Event Horizon, but photons traveling even faster are unable to do so. Seems like BHs are learning new tricks, how to perform neat tricks to fit theories nimble brained cosmologists imagine to be cute little kittens rolling around on the living room floor tangled up in a spool of yarn.